Boca Raton, FL – June 20, 2014 – Modernizing Medicine, Inc., creator of the Electronic Medical Assistant® (EMA™), a cloud-based, specialty-specific electronic medical record (EMR) system, announced that it has been named the number three fastest growing company by the South Florida Business Journal (SFBJ) in its ‘Fast 50.’ This marks the third year in a row Modernizing Medicine has been included on the list, with the last two years earning the number one spot. Each year the SFBJ ranks South Florida’s fastest-growing companies to determine the prestigious ‘Fast 50.’ Companies chosen include both private and public companies and range in industry (including real estate development, manufacturing, technology, healthcare and retail), size and annual revenue. Modernizing Medicine has nearly 4,000 providers across the nation who have used EMA in over 10 million patient encounters. Furthermore, Modernizing Medicine’s data-driven, specialty-specific EMR system can help physicians in surgical specialties achieve better treatment outcomes and better business results for their practices. To date, more than 25 percent of the entire U.S. dermatology market has adopted the platform. The company took additional steps in the effort to help physicians practice evidence-based medicine with the development of schEMA, a powered by Watson app. The app is being created as part of Modernizing Medicine’s participation in the IBM Watson Ecosystem program. By utilizing comprehensive peer-reviewed medical journal articles, schEMA will enable physicians to pose queries, describe symptoms or search for information and statistics about various conditions. EMA users will be able to learn more about this and other facets of EMA during EMA Nation, Modernizing Medicine’s first annual user’s conference this fall. Details about the ‘Fast 50’ and the full list of honorees are available on the South Florida Business Journal’s website. 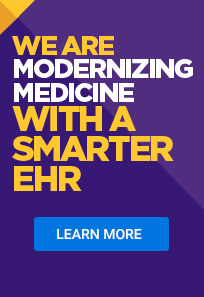 Modernizing Medicine® is transforming how healthcare information is created, consumed and utilized in order to increase efficiency and improve outcomes. Our product, Electronic Medical Assistant® (EMA™), is a cloud-based, specialty-specific electronic medical record (EMR) system with a massive library of built-in medical content. Available as a native iPad application or from almost any web-enabled Mac or PC, EMA adapts to each provider’s unique style of practice and is designed to interface with hundreds of different practice management systems. Today, Modernizing Medicine provides specialty-specific offerings for the dermatology, ophthalmology, orthopedics, otolaryngology, gastroenterology, urology and plastic and cosmetic surgery markets, and to more than 1,300 physician practices across the country.